The highest peak in America is, fittingly, located in the most rugged state in the Union. Mount McKinley, referred to locally by the preferred name of Denali, reaches towards the heavens at a height in excess of 20,000 feet. 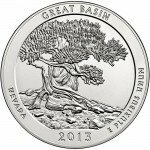 Serving as the centerpiece of Denali National Park and Preserve, it is captured in stunning relief on the 2012 5 oz Denali ATB Silver Coin from Silver.com. A total of only 1,598 coins available with this grade! Given an MS69 grade from the Professional Coin Grading Service. Ships to you in a plastic slab courtesy of the PCGS. When outdoor enthusiasts want to see the highest peak in all of North America, they head to America’s Last Frontier in Alaska. The Denali National Park and Preserve covers a stunning 4.7 million acres of land in the interior of Alaska, and was established as a national park in 1917. Home to Mount McKinley, four glaciers, and a wide variety of wildlife, visitors come from far and wide to climb the mountains, backpack, cross-country ski, and dog sled. 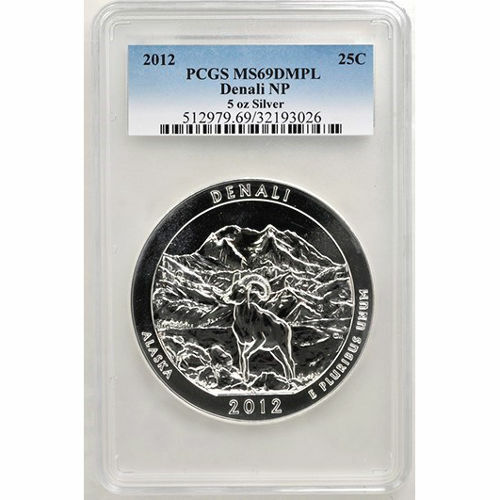 As part of the America the Beautiful coin series, the 2012 5 oz Denali ATB Silver Coin represents the state of Alaska. 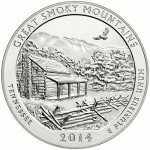 It was the fifth and final coin released during the 2012 production year. Each year, five new coins are released, with a total of 56 coins planned for the entire series. On the reverse, you can see the majesty of Denali (Mount McKinley) as it reaches toward the heavens. At the lower altitudes of the massive mountain, a mountain goat stands with a determined stare on its face. The obverse is graced by President George Washington’s left-profile bust. Each coin is available with an MS69 grade from the PCGS. 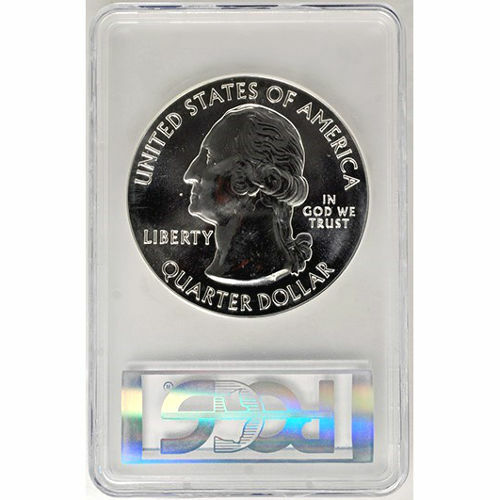 Coins with this grade still have their full, original luster, and no blemishes, contact marks, or detracting flaws. You’ll notice these coins have a deeply-mirrored, proof-like finish that is uncommon on bullion coins. Silver.com associates are available if you have any questions. Our associates can be contacted at 888-989-7223, online through our live web chat, and via email.